Kristin Posehn is an artist and writer based in Los Angeles. She received a Ph.D. in Sculpture from the Winchester School of Art, Winchester, UK, held a two year research and production residency at the Van Eyck, Maastricht, NL, and was awarded the Hermine Van Bers Art Prize, NL, 2009. She was a Visiting Tutor at the Ruskin School of Painting and Drawing, Oxford University, UK, for 2010. An exhibition of her work is permanently on view at the Center for Land Use Interpretation, Wendover. The Center for Art + Environment, Nevada Museum of Art, has collected materials and documentation from her architectural installations, and dedicated an exhibition to this work titled "Kristin Posehn: Architectures" in 2017. 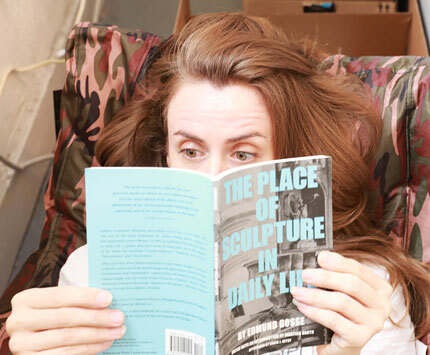 Posehn’s first book was a novella about an artwork, titled Reclamation and published by the Van Eyck, Maastricht, 2012. Her short story “Boy With Frog” was published by The White Review, London, UK, 2016, and "Playing the Whip" was published in the Conjunctions, Fall 2017, Bard College, NY, edited by Bradford Morrow.